Our exceptionally trained Artists deliver the best hair services in the Madison area. Their skill and talent have been developed through in-salon training and advanced education from L´Oreal Professionnel, TIGI, Vidal Sassoon, and Label.m. Based on their years of experience, reputation and demand, our Artists fall into one of 8 levels and excel in both Men's and Women's hair. Gina is a published and experienced hair stylist specializing in extensions, Great Lengths, and Evolve. 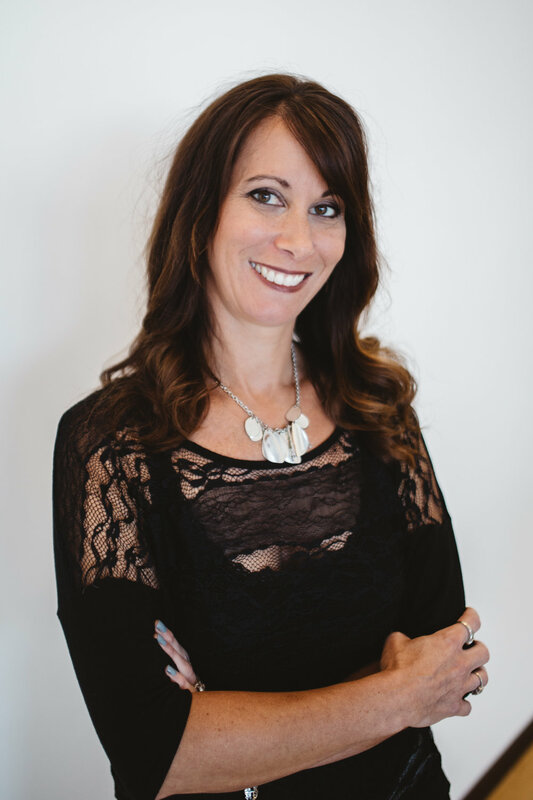 Gina is a member of Intercoiffure, the most powerful and influential organization in the hair dressing industry and serves as Artistic Council and Educator for Evolve Hair Solutions which she helped design and develop in 2011. She is a member of the American Hairloss Council and has been a member of Intercoiffure since 2012. She has studied advanced color and Balayage techniques from L’Oreal Professionnals as well as The French Method and Calligraphy Cutting. Her work has taken her across the U.S. working photo shoots, educating fellow Artists, and promoting her various work endeavors. Certified in Balayage and Calligraphy Cutting, Emily has focused on elevating her craft and continues to expand proficiency in hair cutting and color application. Her extensive knowledge stems from advanced training by the industry’s best International Artists including time spent in L'Oreal’s Soho Academy in New York. Emily's unique vision, specialized cutting techniques, and in-depth understanding of L’Oreal Professional Color come together to create transformative results in her clientele. Versatility, creativity and creating a unique client experience are trademarks of Margaret’s practice. She has traveled to New York City, Atlanta, Dallas, Los Angeles and France acquiring certifications in Balayage, Calligraphy cutting and TIGI Advanced cutting, as well as studying The French Method (which has a strong influence on her approach.) Margaret is skilled in both modern and classic styles resulting in a diverse book of cross-generational clients. Whether she’s maintaining or “freshening up” a current look or providing a complete transformation, Margaret delivers the desired style in a relaxing, respectful environment that is sensitive and complementary to all aspects of beauty. Precision short hair and natural form haircutting are trademarks of Teri's technique behind the chair. Training at Vidal Sassoon in London and Men's Barbering in South Beach, Florida make this artist stand out as a master cutter. Certification from TIGI in Personalized Cutting results in balanced, customized cuts. Her success with short hair can be attributed to her attention to natural growth direction and she has become a salon leader in natural color, grey blending and grey transitioning. Rebecca is an accomplished Artist with over 25 years of experience. She specializes in dimensional global color, Balayage, highlights, perms and razor cuts. Precision cutting paired with her artistic vision and attention to detail means clients will achieve the look that pairs with their lifestyle and beauty goals. Rebecca attends a variety of educational classes to stay in tune with the latest techniques and styles and her in-depth knowledge of products empowers clients to recreate their look at home. From contemporary classic cuts and subtle color to funky avant garde style, Rebecca’s clients leave pleased with their experience and result. Bentley’s cutting and coloring techniques stem from classic and modern styles learned at the Toni & Guy and L’Oreal Professionnel Academies in New York City, Dallas, and Las Vegas. Her experience as an Ambassador for TIGI and her participation in professional development courses have bolstered her confidence to educate her clients and fellow Artists. The trends and cultures experienced while traveling the world inspire her creativity and have shaped her into a talented and accomplished Artist for both men and women. After almost three decades working for ANiU Salon, Debbie continues to be the energizing force she was on day one. Her love for her clients and her craft have inspired her quest for education locally and in cities like Dallas, Long Beach, Atlanta, Las Vegas, and New York. She loves providing haircutting, coloring and facial waxing for her clients and continues to seek out new opportunities for personal and professional growth. With a passion for education, Taylor travels across the country teaching and training as an Educator for Label.m. As a session stylist, Taylor has perfected a range of styles including braiding and upstyling showcased while working both London and New York Fashion Week. Training with L'Oreal Professionnels, Label.m and Vidal Sassoon have made her a sought after colorist for Balayage and freehand techniques behind the chair and a qualified Cutting Educator for the hair Artists at ANiU Salon. Courtney’s result-driven approach to haircutting and color enables the creation of custom, inventive looks. Proficiency in facial and full-body waxing can be attributed to Courtney’s attention to detail and professionalism. She has studied at L’Oreals Soho Academy in New York and uses advanced strategies from top industry leaders to create colors ranging from fashion shades and vibrant reds to dimensional blondes and brunettes. Her emphasize on client experience and personalization make for relaxed and engaging encounters as she works to build lasting relationships with each individual. Specializing in Balayage and grey coverage, Kate holds certifications from L’Oreal Professionnel and Vidal Sassoon in Balayage, Color Education, and haircutting. Kate began her education career with Goldwell teaching throughout the Midwest and now serves as Color Educator ar ANiU Salon. She has a passion for learning, sharing, and growing. Kate continues to train across the U.S. and Canada. Elizabeth has spent over a decade at ANiU perfecting her color, cutting, and natural nails skill set. Studying under the industry’s top International Artists in New York, Elizabeth has perfected advanced color techniques, hairpainting and foiling trends. Avant-garde and runway demos have inspired and expanded Elizabeth’s portfolio. Her work is a cultivation of well-executed, creative, and fashionable designs. Creativity and customization drive Jemree's passion. She performs a variety of services, including haircuts, coloring, Balayage, special occasion styling, and makeup. Her work showcases personal beauty and she tailors the look to each client’s hair type and lifestyle. Jemree is confident working with textured hair as well as edgy looks, shorter cuts, and a variety of hair color techniques. As a member of ANiU’s Bridal Team and ANiU’s Makeup Educator, she enjoys creating looks from classic to avant-garde. Jemree’s education includes training with Tigi, L’Oréal Professionnel Soho Academy, and Warren Tricomi. Excelling in women's haircutting, coloring, and makeup, Andrea gives life to the ideas and desired outcomes of her clientele. Attending the annual Redken Symposium in Las Vegas and The Makeup Show in Chicago drives her to pursue the most current creative and technical trends. Her passion for skincare has resulted in a firm understanding of Eminence Hungarian Organic Skincare, Facial Waxing, and Facial services. Andrea has undergone advanced training at the International Dermal Institute in Chicago as well as regularly attending Eminence Regional Training. Lexi serves as Bridal Educator to ANiU’s staff specializing in upstyling for weddings and special occasions. She is an important part of ANiU’s Bridal team and is a sought-after Hair Artist for local Brides. Lexi is an Educator for the luxury styling tool brand, ghd and travels the US teaching in-salon classes and working hair shows. She has attended L'Oreal Professionel's top styling classes in Denver, New York, and Los Angeles and has completed her L’Oreal Styling Certification. Lexi is inspired by the ever changing industry and passionately motivated to continue to learn and grow with it. Lacey excels in women’s hair including cutting, coloring, extensions, and styling. Yearly training in special occasion and bridal trends help her create looks ranging from smooth, timeless upstyles to loose, textured braids and waves. Lacey is certified in Aqua Tape-In Extensions which add length, dimension, and/or volume to the hair. She has additional training in techniques like balay-foil and dimensional color application through L’Oreal Professionnel. Winona specializes in Balayage, Hair Painting, and Corrective Color. Her portfolio ranges from deep brunettes to platinum blondes showcasing a full spectrum of techniques and styles from bold, dimensional sweeps of colors to natural lived-in hair. Winona prioritizes her education through L’Oreal Professionnel and pursues a deeper understanding of hair health and hair color performance. Winona provides the Cezanne Smoothing Treatment at ANiU Salon and is a skilled member of ANiU’s Bridal Team offering upstyling for weddings and special occasions. Helping people look and feel beautiful motivates Amber to learn the newest trends from L’Oreal’s top International Artists. She focuses on creating beautiful dimensional looks through a variety of cutting and coloring techniques specializing in Balayage application. Amber devotes time and care to the coverage of grey hair and maintaining integrity of the hair. Her talent for upstyling has cemented her place as a valued member of ANiU’s Bridal Team and she loves creating textured boho upstyles. She works to advance her skills through constant training in-salon and through L’Oreal Professionnel. Morgan has a comprehensive knowledge of L’Oreal Professionnel Color specializing in Balayage, blondes, color corrections, and dimensional haircolor. Morgan is a valued member of ANiU’s Bridal Team specializing in upstyling and makeup application for weddings, homecoming, prom, and special occasions. Skilled in hair and nail services, Riley is a multi-faceted Artist specializing in Balayage and long hair. She enjoys creating a stunning range of blonde shades from rich, multi-tonal colors to memorable platinum hues. Riley provides facial waxing services and her love of shellac and natural nails make her a stand out Nail Artist. She works to enhance each individual’s unique beauty and loves bringing out the best in each person. Methodical and precise, Anne is known for creating gorgeous hair looks that have her clientele leaving happy and beautiful. Inspired by cutting-edge trends, she has pursued training with L’Oreal Professionnel Artists and Sassoon Academy in Chicago. Well-versed in Sassoon Foundation Cutting and Toni & Guy Cutting Classics, Anne tailors her cutting to each client’s unique style and beauty. Anne is passionate about all aspects of haircolor services specializing in bright dimensional blondes. Meghan is a captivating young Artist whose dedication to beauty and style results in gorgeous designs. Meghan offers hair color, cutting, and styling specializing in balayage techniques. She is a valuable member of ANiU’s Bridal Team turning out truly stunning Hair and Makeup looks for weddings and special occasions. Her natural talent as a Nail Artist is apparent in her beautifully done manicure and pedicures. Bret impresses as a Makeup Artist for ANiU’s Bridal Team and creates striking, polished makeup looks for bridal and special occasions. She loves making clients feel beautiful and celebrates the uniqueness of beauty in each individual client. She specializes in blondes and Balayage and is skilled in all aspects of women’s haircolor through her involvement in L’Oreal Professionnel training at ANiU Salon. Stella has an eye for creating natural, seamless color blends using complementary tones and a variety of color techniques. She establishes a plan for each client based on their concerns, lifestyle, and realistic goals. Results are balanced and beautiful while the hair remains shiny, healthy and manageable. She continues to train with L’Oreal Professionnels and ANiU Salon. Stella creates beauty in the salon and offers helpful advice on maintaining each look at home. A talented emerging Artist, Jordyn offers dynamic cuts and colors for men, women, and children. Ongoing training through L’Oreal Professionnels result in modern, customized creations that utilize a variety of global and dimensional application techniques including freehand and Balayage. Jordyn ensures the quality of the hair is never compromised and offers sound advice on home hair care and style. She loves her work and is inspired by Artists at ANiU and around the world. Mallory finds inspiration in the work of like-minded Artists on social media and works hard to bring those ideas and innovations to ANiU. She specializes in hair color and Balayage techniques as well as haircutting. Mallory’s passion for learning and creating are constant motivators to invent new styles and looks for her clients. Meredith is a valuable Artist at ANiU Salon. A Middleton native, Meredith attended college at Carroll University before enrolling in ANiU’s Apprenticeship program. Meredith has always been interested in the beauty industry and shows promising talent in women’s hair color and men’s hair cutting. Our Nail Artists are educated in Creative Nail Design (CND) and OPI products and services. Pamela comes to ANiU after nine years as Curriculum Director for Capri College. She is an original member of the Salon 2000 team and was inspired to work for ANiU after touring area salons with her students. Her previous experience as a Nail Technician at JCP Salons make her an expert in sanitation guidelines and salon services. She excels in natural, shellac, and artificial nail services. Mattie is an accomplished Nail Artist, excelling at Brisa Gel, Shellac, and Natural Nails. She has received training from Elite Nail School, CND, and renowned Tech and Competitor, Amy Becker. Her love of nail shaping, sculpting, and care paired with the joy of meeting and interacting with a variety of unique personalities make her an ideal match for those looking for consistent, quality work. Since 1996, Sara has been a valuable addition to ANiU’s team of Spa Professionals. She is licensed in both massage and cosmetology and specializes in Tui Na Chinese Massage, Acupressure, and Stone Massage. She offers manicure and pedicure services and feels passionate about her skincare services using Eminence Hungarian Organic Skincare because of their highly effective results and earth friendly practice.